Troupe talk is back this week and in celebration of spring, Mother's Day, and baked goods (because we should always celebrate baked goods), Cupcake has joined me for some sweet talk about improvising, the new Dallas Comedy House (DCH) and each other. Thank you for bringing me this basket of gifts as a token of thanks for interviewing you! Why don’t you tell our readers what each of you gave me? Christie: Everyone brought you cupcakes, so I brought you something to wash them down with. CUPCAKE MILKSHAKES!! Maggie: I gave you the cupcake that Mariam is eating in the next question…she just couldn’t stop herself. Nick: There is a giant cupcake beside the basket. When you cut it to finally eat it, you find my charred remains inside. I wanted to surprise you by popping out of the giant cupcake, but I don’t know how to bake and put myself in the cupcake before the baking process rather than after. Tommy: I helped Nick bake the giant cupcake for you, thinking it was from us both. Mariam: I brought you a fried chicken cupcake to break up the monotony of all the sweet and/or Nick’s-ashes-flavored cupcakes. Pretend you are all sitting in a circle. Look to the person to the left of you and tell me what flavor cupcake they would be and why. Christie: Maggie is a cupcake as big and bright as the sun! She has rainbow icing and unicorn sprinkles, because she is happiness in a giant baked good! Maggie: Mariam would probably be this cupcake. 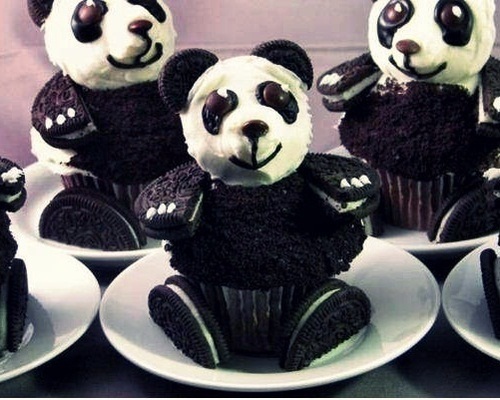 It’s a cupcake that has been build to look like a panda. That’s because Mariam is beautiful—just like a panda cupcake. Mariam: Nick’s cupcake would taste like despair and sadness, with a hint of chocolate. And it would have a khaki short wrapper around it. Nick: Tommy would probably be a pizza cupcake. Cheese and pepperoni on top of garlic bread. Then a tiny hot dog to top it all off, because Tommy always has his party shorts on, but he can take care of business as well. Tommy: Christie would be a love cupcake. With tiny pig filling and puppy icing. Now that you’ve defined your individual cupcake flavors, let’s talk about Cupcake as a whole! How did you guys meet? How long have you been together? Christie: I’m really bad at math, but I’m really awesome at friendship. This made for the perfect troupe! We’ve been performing for over two years, but we’ve been friends for a lifetime. *Someone check my math on that. * Maggie: Much like *NSYNC, Cupcake was put together to dominate the 2013 DCH Improv Cagematch Tournament. Though we got second place to a bunch of cousins, we still made beautiful music. We’ve been performing ever since. And, apparently, math. Mariam: I received an anonymous invitation to join a new secret-agent, mathematically-constructed, *NSYNC-inspired, bulletproof improv troupe. I blindly accepted. The purpose of said troupe? To dominate the 2013 DCH Improv Cagematch Tournament. We got second place. YOU DO THE MATH. Nick: Tommy and Christie used math equations and science to formulate the most perfect complimentary improv troupe that would dominate the 2013 DCH Improv Cagematch Tournament. Even with math on our side, we came in second. BUT ONLY BY TWO VOTES. Tommy: Christie and I created the perfect plan to come in second in the 2013 DCH Improv Cagematch and create a famous and timeless rivalry that would never be rivaled by other fabled rivalries. Why do you dig improvising? Christie: There’s nothing better than making people laugh. Unless you’re getting to do that with your best friends, WHICH I AM. Maggie: It’s fun to spend 30 minutes not thinking—just reacting and having fun with friends. Mariam: I can let go and be stupid and do crazy things with people who are funny and smart and make me laugh and be a better person. Nick: Because I crave instant gratification and approval. Tommy: It's the next best thing to playing with your friends as a little kid. It's like the fountain of youth, but you still age and die. Cupcake performs at DCH on May 16 (grand-opening weekend! ), May 22, and June 25.